The award season is over, but the impending summer movie season is just gearing up. Yes, 2015 promises a slate of blockbusters to look forward to, from franchise heroes like James Bond, Terminator, to such new tales as Fifty Shades of Grey. Can't wait for those long-waited big-budget movies? As a matter of fact, many new movie trailers for the biggest 2015 summer holiday are already on YouTube before the theatrical release, you can therefore just watch the teaser trailers on YouTube to get a glimpse of the incoming Hollywood movies and mark on the your calendar the ones you are interested in so as not to miss the release date. Film trailer is a collection of the movie highlights and it's rarely disappointing, even if the full-length movie doesn't live up to its official trailer at all. However, you may notice a problem while enjoying these trailers online. Well, as mentioned above, this year will be jam-packed with all-category movies, and the number of that is "substantial". If you have to endure the ads for like one minute, and wait for the video buffering for another two or three (if you are lucky to have a stable internet connection), to enjoy those teasers, previews or trailers will seem to be not that pleasant. Why not free download movie trailers from YouTube for smooth playback whenever you are free on your smartphone or tablet near you? 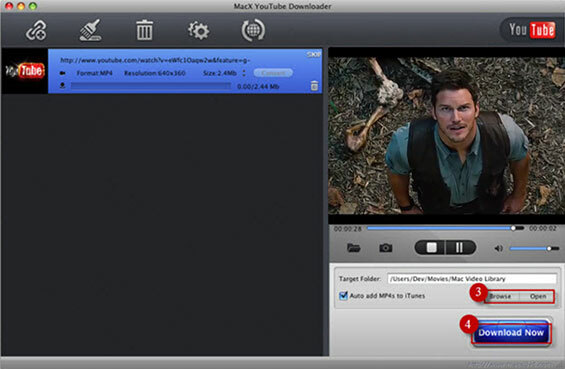 To deal with the task, you can rely on MacX YouTube Downloader, which is able to free download any videos and free movies, be it in MP4, AVI, MKV, FLV, 3GP, 1080P, 4K ultra HD, etc with fast speed and original quality reserved. It aslo supports batch video downloading, namely you are allowed to download multiple contents including the movie trailers from YouTube at one stroke. Besides, it automatically transfers the downloaded MP4 files to iTunes for later playback on iPhone iPad iPod. Step 1: After free downloading and running this YouTube downloader, open your web browser and find the offial trailer on YouTube you'd like to download. Copy the video URL, paste it to the message box and then click "analyze" to load the video details. Alternatively, you can press "paste & analyze" button and it will automatically detect the YouTube video. Step 2: Choose video format, resolution and file size that you desire to get after the download. For easy playback on your mobile devices, you are suggested to download the teaser treailer into MP4, the most-commonly used format. Step 3: Press "Browse" button to specify an output folder on your computer to save the video. Step 4: Hit "Download Now" to start downloading the trailer video from YouTube. Only several mins, you are allowed to enjoy the terrific blockbuster without any bother. Tips: If you want to download the full length movie and convert it so as to play on your mobile phones, tablets, or tvs or so, you can resort to the advanced version - MacX Video Converter Pro, which can not only free download movie trailers of 2015- 2018, but aslo capture the full summer blockbustersbut with no quality loss, based on its recording feature. Statistics showed that official trailers on YouTube were 3X influential than any other source when it comes to how moviegoers decide what files to see. The following top picks of YouTube's movie trailers are just in response to those eager to know which one is the most-expected film to watch. No 1: Star Wars: The Force Awakens - This movie earned the no.1 spot on the list. There are 2 HD teaser trailers (about 88 seconds) for Star Wars 7 on YouTube, generating a combined 120 million views in total. No 2: Fifty Shades of Grey on YouTube - It is estimated that Fifty Shades of Grey is the most-watched teaser reel of 2014 on YouTube. However, with the ferocious momentum of the 7th installment of Star Wars, this film trailer falls behind, gathering 104million views on YouTube. No 3: Avengers 2: Age of Ultron - The trailer behind the two mentioned above is Marvel's Avengers: Age of Ultron, soaring to 92 million YouTube views so far, making it another one of the most-viewed video on YouTube. Actually, there are other trailing behind the three like Jurassic World, Furious 7 and more, receiving high views on YouTube. The official trailers can however backfire, only ending up confusing the viewers. Therefore, sometimes you will want to edit and even remake your own video content with the best parts of the movie, so as to entice potential viewers and entertian YouTube visitors. In this case, you can rely on iMovie, an Apple developed video editor with professional editing feature. 1. Import a Movie Into iMovie: Click Import to load the video on your computer and then select the movie from the Event Library. From the File menu, select New Project. Then enter a name for your project in the Name field, and then select an aspect ratio and frame rate. 2. Select a Template: Click the template you want to use for your trailer. 3. Create a Trailer: click Create and choose an event you want to save. 4. Watch and Share Your creation. iMovie is quite professional in editing, however, learning how to iMovie can be challenging as the layout is not "beginning user-friendly" and some movie trailers can be hard to be imported into it if they are not in iMovie supported formats, which are quite limited. 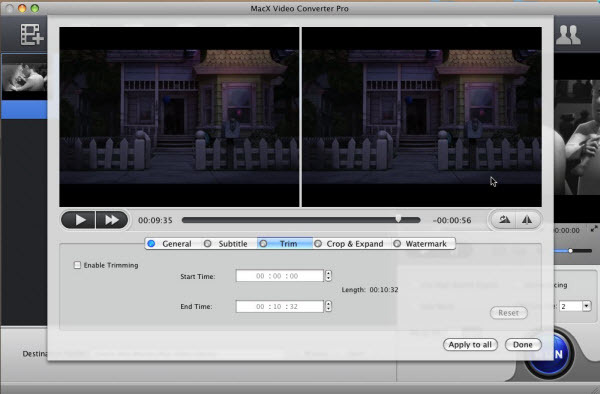 Here the MacX Video Converter Pro also comes as an excellent iMovie alternative to allow users not only download movies and other videos from YouTube, but also edit the video content, like trimming, merging, cropping, adding subtitles, watermarks and special effetc etc. Catch up the latest trailers that are available now. Below we selected several most viewed ones on YouTube for you to have a sneak peek at the huge potential blockbusters. 2016 is drawing near with numerous blockbusters, and some of which have already released their HD teasers on YouTube. Wanna to see what films are coming in 2016? Want to have a sneak peak of the 2016 best movies? You may also get the 2016 new trailers download in HD MP4, AVI, 3GP from YouTube etc as per the guide above to catch up with the latest highlights of the blockbusters. Below we list the most-watched 2016 new movie trailers on YouTube, together with the theater date of each movie.